Ketchikan artist Terry Pyles had a brainstorm at the world-famous Rijksmuseum in Amsterdam, while staring at Alejandro de Loarte’s 1610 painting The Kitchen. 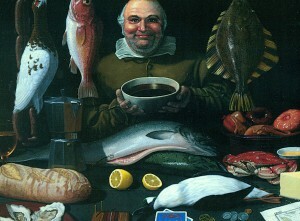 The work portrays a jolly and prosperous European man, surrounded by fish and game ready for the cooking pot. 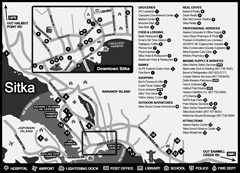 Pyles said he immediately thought of an Alaskan in his kitchen, surrounded by regional delicacies. 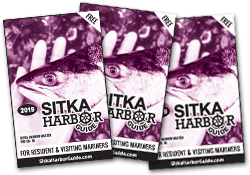 Pyles’ friend Dave is Ketchikan artist Dave Rubin, whose face adorns the cover of this year’s Sitka Harbor Guide. Pyles’ original acrylic on canvas work measures 20 inches wide by 15 inches high and is titled Alaska Kitchen Scene. Alaska Kitchen Scene reveals such depth as it depicts Rubin and other Alaskan `fauna’ — king salmon, crab, sourdough bread, starry flounder, ptarmigan, rockfish and bufflehead duck. Pyles has lived in Ketchikan for 40-plus years and has made his living from his art for most of that time. He grew up on Whidbey Island, near Seattle, where his family encouraged him to develop the talent he had shown at an early age. His work is mostly wildlife and natural scenes, but he feels the market for naturalistic art peaked about 2000. Pyles is now exploring other media, such as stained glass. He also paints aviation and marine subjects. 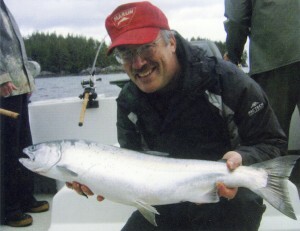 He is responsible for the giant mosaic salmon that graces downtown Ketchikan.